Left main disease : How to add “Angle and Size”to Medina classification ? Medina classification is the most popular angiographic classification of bifurcation lesions based on the presence or absence lesions at the three levels of branching (0,0,0 ) to (1,1,1). The popularity of this scheme is essentially due to its simplicity. It can further be subdivided according to angle and size .Though there are three angles possible it is the angle of LM with LCX that matters most. Three types of Y according to size of branch vessel size. Y1 Large left main divided two equal LAD, LCX. Y3 All three are equal diameter. Here is a series of lectures on left main (Probably the best I guess !) from Dr.Boris Varshisky ,Hadassah University hospital Jeruselam.He critically discusses about the nuances of left main disease from pathology, technical and therapeutic considerations. This simple question in Atrial Flutter ECG bothered me for long ! . . . Is the saw tooth upright or Inverted ? We know, classical Atrial flutter (Also referred to as typical /Common AF) records saw toothed F waves due to continuous atrial electrical activity across a macro- reentrant circuit within right atrium. Though this saw tooth pattern is easily recognised , it’s often difficult to say whether the saw is facing upwards or downwards ? ie Is the flutter waves are inverted or upright ? The general rule is the shallow stroke (one with a lesser slope) is to be termed as antegrade / initial deflection that will determine the direction of flutter waves. * Note: In lead the polarity of F waves in V1 it will be opposite of that of inferior leads. Why should we bother about direction of flutter waves ? It may not be important for those hifi EP guys who can ablate complex arrhythmia with intra cardiac GPS catheters and accurate electro anatomic mapping system. Still , the surface ECG always help us understand the basic circuits of flutter. 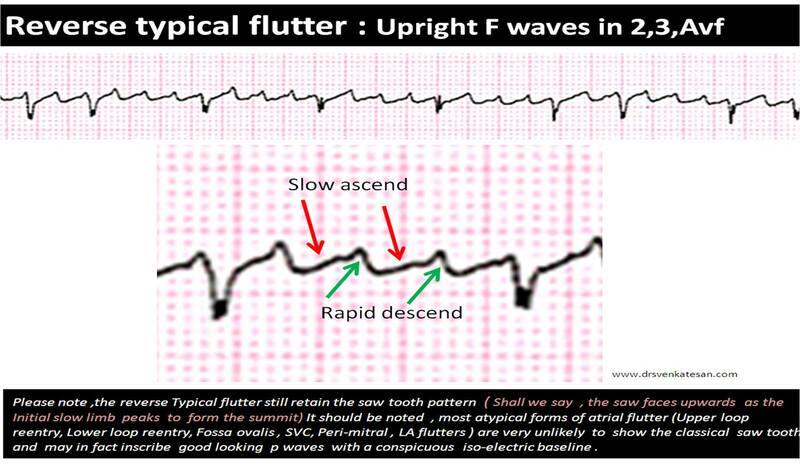 Reverse typical flutter should not be confused with atypical flutter where typical saw tooth waves are uncommon.The later group is termed as atypical atrial flutter that arises from various other focus including left atrium.